A classic holiday hot chocolate. 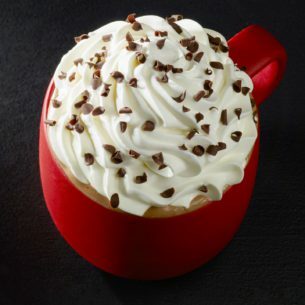 Made with chocolate mocha sauce, peppermint-flavored syrup and steamed milk topped with sweetened whipped cream and dark chocolate curls. Milk, Mocha Sauce [Water, Sugar, Cocoa Processed With Alkali, Natural Flavor], Peppermint Syrup [Sugar, Water, Natural Flavor, Sodium Benzoate, Citric Acid], Whipped Cream [Cream (Cream, Mono And Diglycerides, Carageenan), Vanilla Syrup (Sugar, Water, Natural Flavors, Potassium Sorbate, Citric Acid)], Vanilla Syrup [Sugar, Water, Natural Flavors, Potassium Sorbate, Citric Acid], Dark Chocolate Curls [Sugar, Chocolate Mass (Processed With Alkali), Cocoa Butter, Soy Lecithin, Vanilla Extract].